Where would you go if you wanted to treat yourself to seriously good meats for shabu-shabu and sukiyaki without burning too big a hole in your pocket? 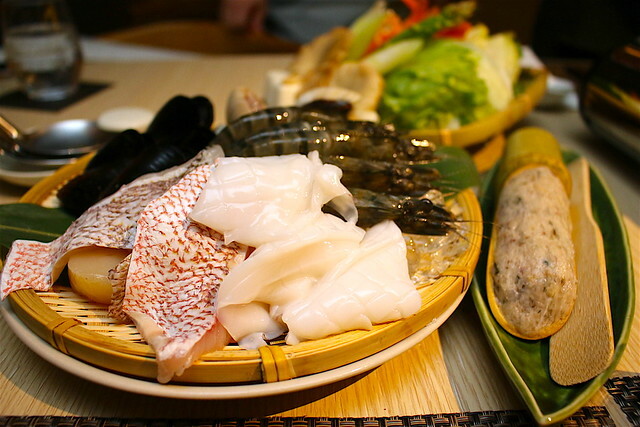 As we know only too wistfully, quality Japanese ingredients are sublime but don't come cheap. Well, we found Sakurazaka at Greenwood Avenue with some great value sets for Japanese hotpot. Yatta! 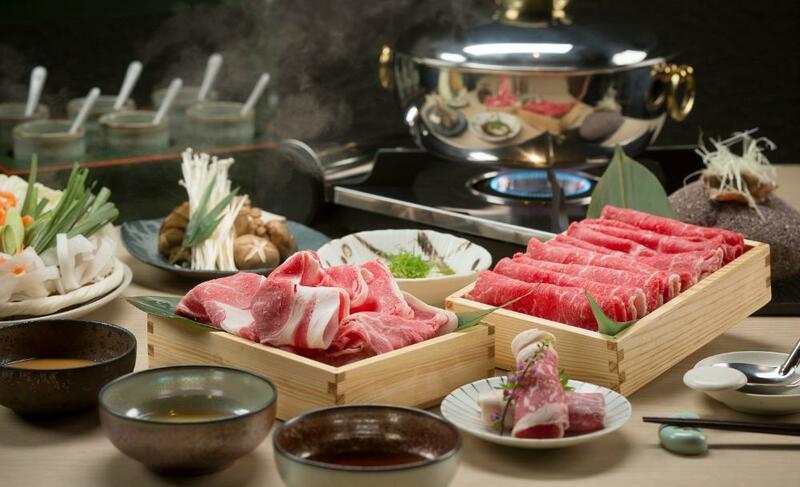 Pick from three Shabu Shabu sets - Pork (S$48), Seafood (S$54), or Beef (S$64). Each set comes with a tamago onsen egg, a stone-grilled Ishiyaki, meats, vegetables, and a Kakigori dessert for a refreshing end. You'll be dining in very pleasant surroundings too. 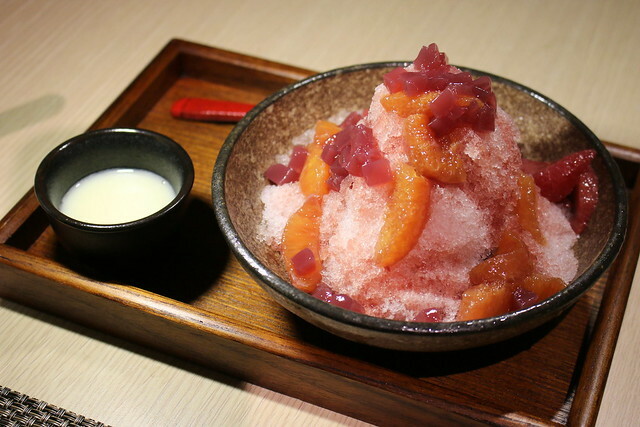 Sakurazaka or "Blossom Hill" is named after a nice wooded suburb outside Fukuoka on the island of Kyushu, Japan where Consultant Chef Masashi Horiuchi is from. Greenwood Avenue was chosen because it bears some resemblance to Sakurazaka with its leafy roadways and quiet affluence. 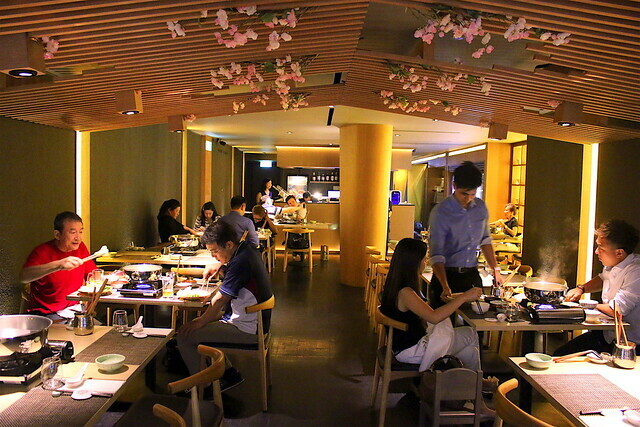 The use of wood in the walls, ceilings and furniture also anchors the nature theme, while the open layout of the restaurant makes for convivial dining. Here Chef Masashi infuses his heritage cuisine with European flair from his culinary training. You'll find broth bases like Fish Bouillabaisse, Poulet (chicken, with leeks, carrots and onions) and Beef Consommé next to Ago Dashi (stock made from flying fish, a Kyushu specialty), and Tonkotsu (pork bone). The Ago Dashi is the lightest one of them all, just lightly umami. Most of the broths are not too heavy, so you'll still get to enjoy the natural taste of the ingredients. 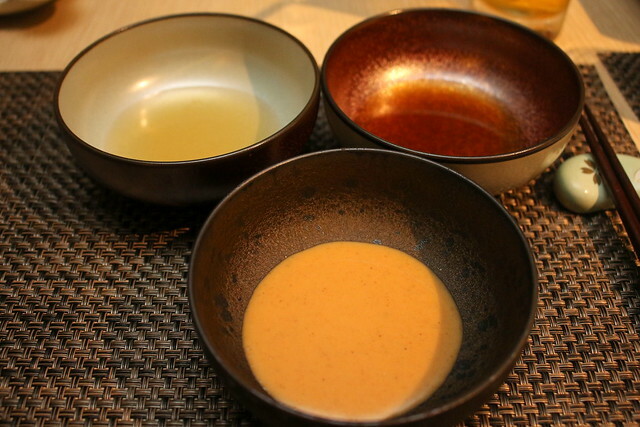 - Tamari Ponzu (top left): Mix of yuzu, suagr, dashi and tamari (an essence from miso, instead of soy sauce). I love the utensils, especially the giant wooden tongs (in the metal container) for your raw ingredients. 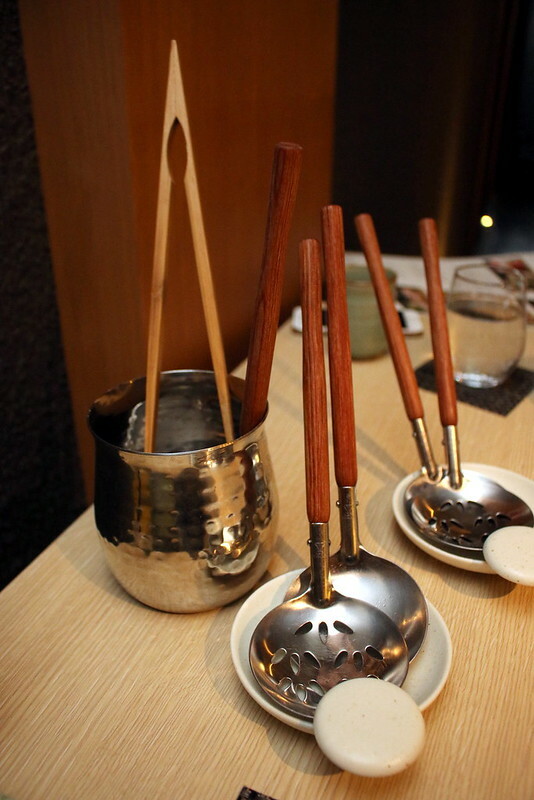 Some people have (very sadly) mistaken them for chopsticks, and have split them apart like those disposable chopsticks. The Ishiyaki (hot stone) is heated in oven to a 140 degrees, and you can cook your starter meats on this. It smells so good when the meats are sizzling on this. You can eat the meat on its own or dip it into the Onsen Tamago - Japanese half-boiled egg with spring onions and sukiyaki sauce. 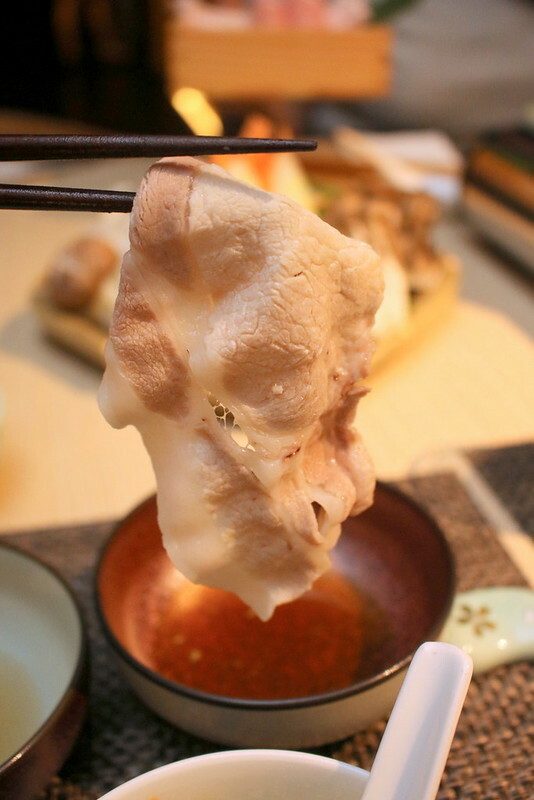 For the Pork Set, it's not Kurobuta (black pig) but Shirobuta (white pig) pork, prized for its unique sweet signature and delicate tenderness. The pork is from Kagoshima (that magical land of exquisite produce). You get both loin and belly; the latter is more fatty and tender. The slices of pork just need a few swishes in the hot broth. It's actually really tasty on its own, even without the dipping sauces. The Seafood Set gives you Tiger Prawns, White Clams, Scallops, Red Snapper Squid, Mussels, Prawn Ball, along with a platter of vegetables. The beef set gives you Aomori Japanese Rice-Fed Beef - the cattle is fed with Japanese whole rice for 'umami' flavour and they are given spring water from Mount Hakkoda. These cows have lived better than me. Oh #shabushabu how I love you. Fantastic #Japanese #beef from Aomori at @sakurazakasg - a huge #ribeye slice is about to go #swimming in beef #consommé. 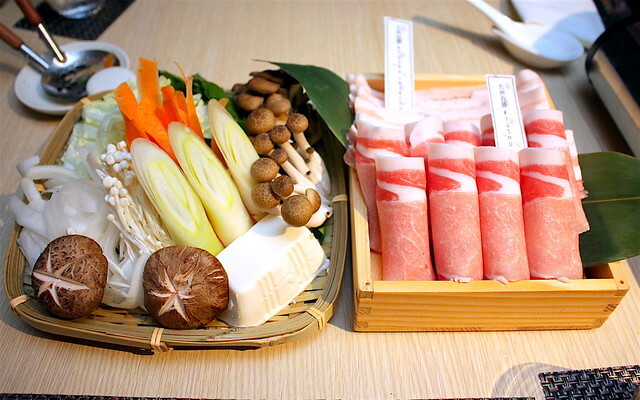 Sakurazaka has authentic shabu-shabu and #sukiyaki but with European flair. 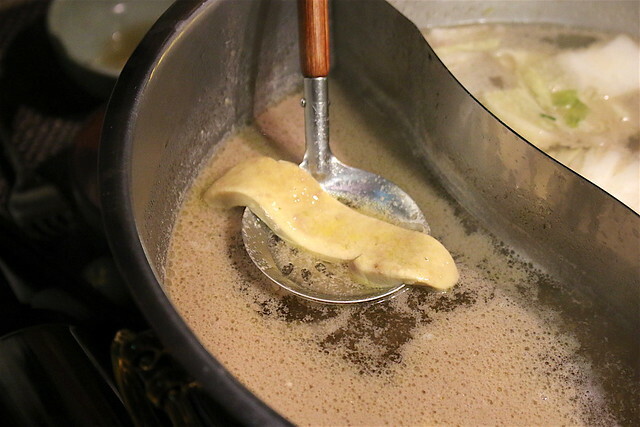 Expect broths like bouillabaisse next to ago #dashi (made with flying fish) and tonkotsu. 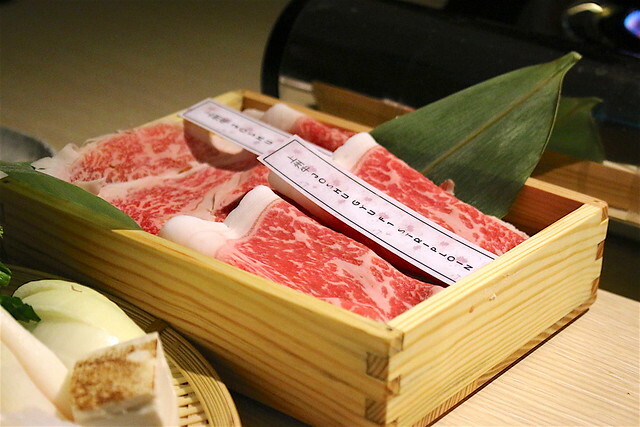 The Joshu Wagyu has the richest marbling of them all. Order it from the a la carte menu or just top up S$25 to get this for your set. 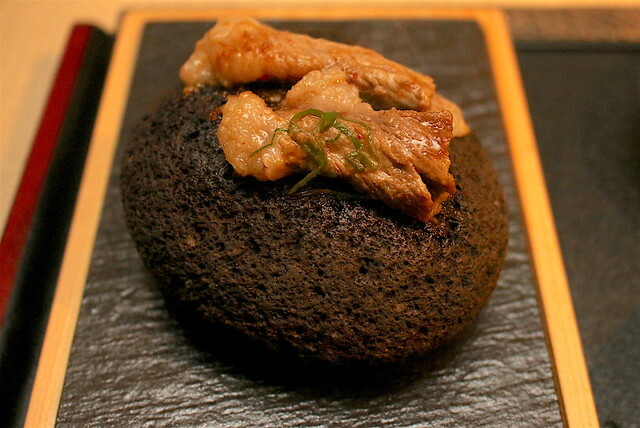 This wagyu is from Japanese Black cattle raised in the Gunma prefecture. It's got an aromatic sweetness that's almost floral but is very fatty indeed (a little too rich for me, to be honest). You get both striploin and ribeye. There are also a la carte items, such as the foie gras. But I feel that this fatty liver is still best served pan-seared. 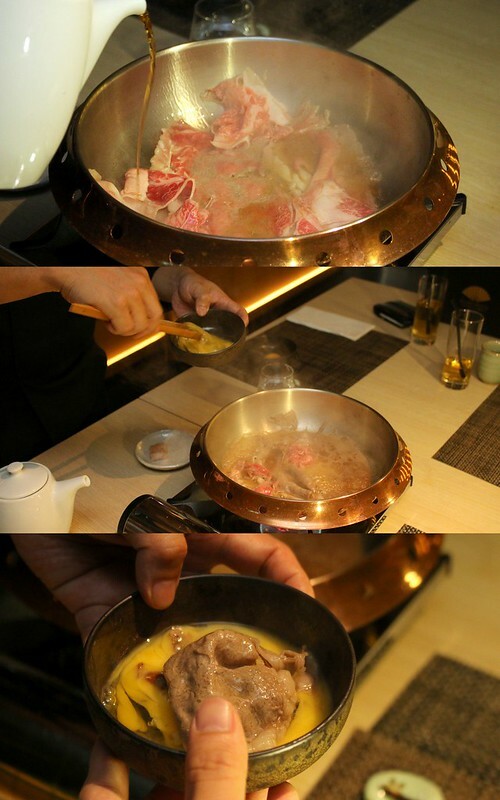 You can opt for Sukiyaki instead of Shabu-Shabu. 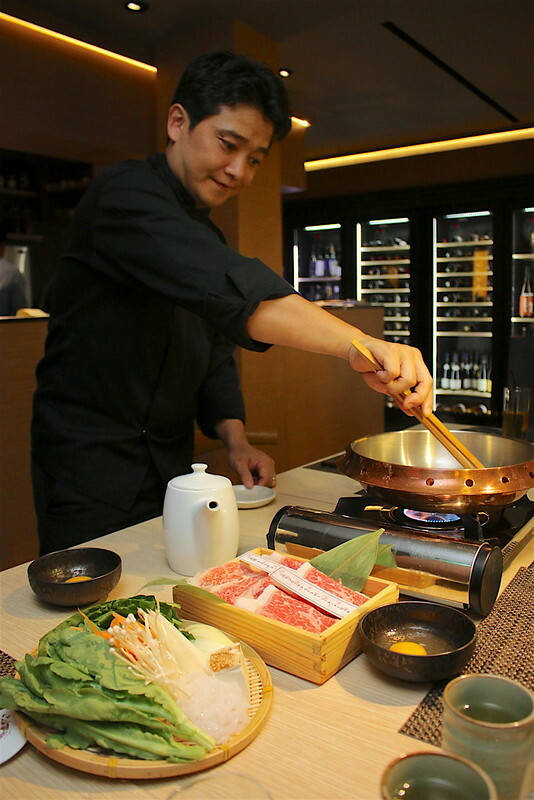 The chef tosses the meats in mirin, soy, sugar and dash of sake. Then the meat is dipped in raw egg (as is traditional but is optional) for a silky coating. 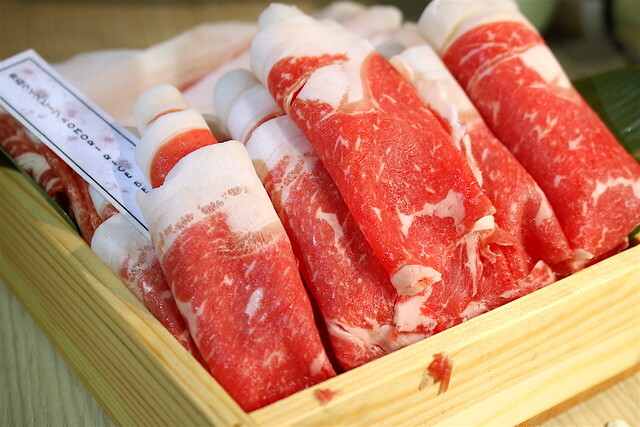 For the Sukiyaki we had the Japanese Wagyu-Holstein F1 Crossbreed which has very good marbling and is considered the best cross-bred Wagyu. Who knew dairy cows (the iconic black and white Holsteins) could taste this good when paired off with Japanese cattle? But the best part is when you've finished all the meats and vegetables. Rice is added to make Risotto! 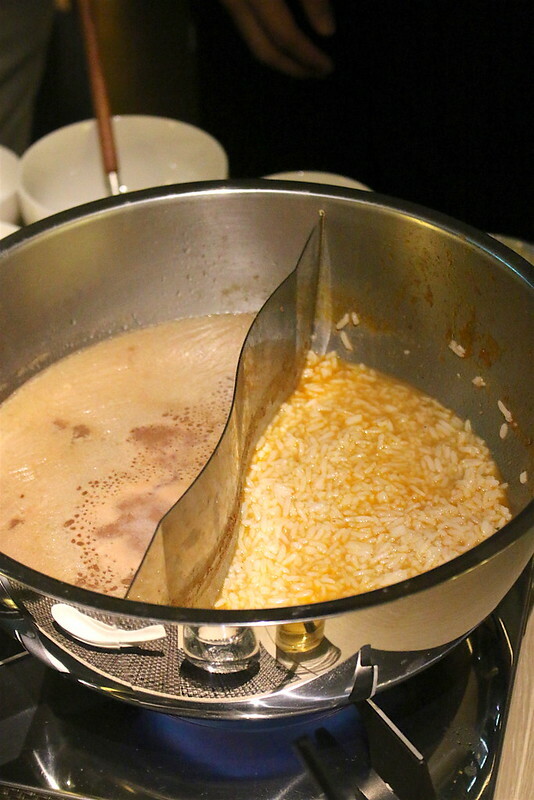 The rice has been pre-cooked a little, so you won't have to wait or stir too long. We used the Bouillabaisse stock and it just blew our minds with how umami the final stock was. I could have eaten two bowls, and I don't even normally like risotto! 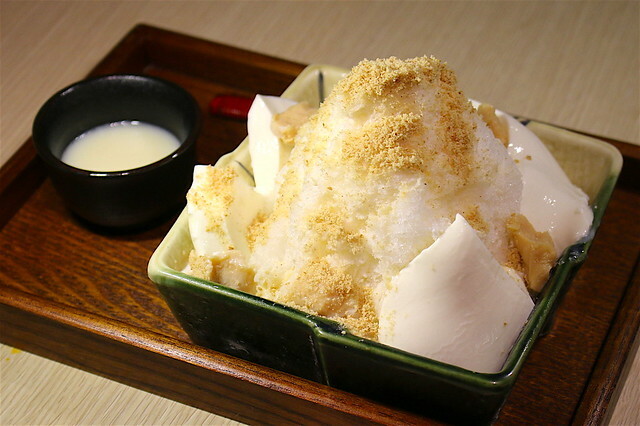 For dessert - you have several flavours of shaved ice Kakigori to choose from! 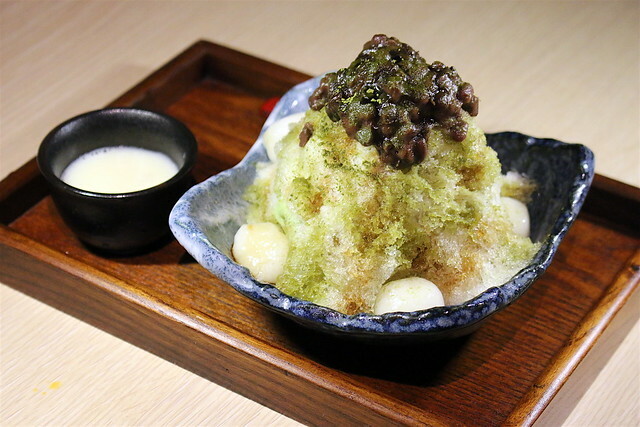 This is the Ujikintoki - a traditional kakigori, with azuki beans, matcha syrup, matcha ice cream, shiratama and kuromitsu. Condensed milk is served on the side, should you wish to make it more milky and sweet (we didn't need it). Hokkaido milk - milk sauce, milk pudding, milk candy, cookie crumble. Port wine - port wine sauce, citrus confit, red wine jelly cube. This is pretty strong, and should please wine lovers! Tiramisu - Coffee syrup and ice cream, crunch chocolate pearls, crunchy coffee sponge, mascarpon espuma, cacao powder. 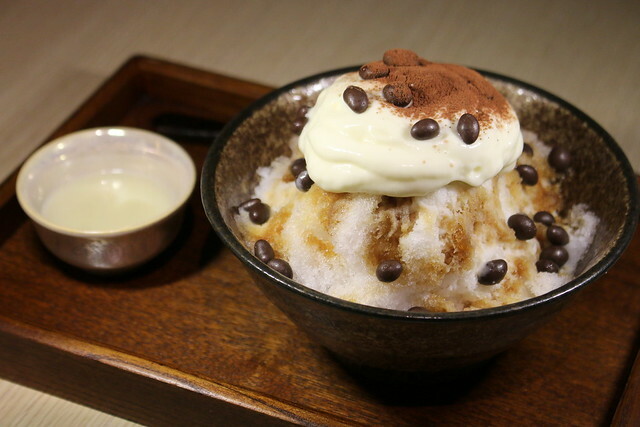 I thought I would like this one, since I love tiramisu, but I ended up preferring the traditional Ujikintoki. Given that Sakurazaka is a concept by Wine Culture, you can be assured of a decent selection of wines, sake, and Japanese craft beers. Sakurazaka is definitely worth a visit for the premium meats and good value sets. The only drawback is the location. It's a little hard to get to without a car, but you can alight at the Tan Kah Kee MRT station (Downtown Line) and enjoy a 10-minute picturesque walk down the leafy avenues that is gently reminiscent of the real Sakurazaka in Japan.